With a competitive global economy, soaring energy prices, increasing environmental issues and technology-based decision making, your profitability depends on the ability to analyze and control operating costs. 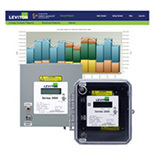 VerifEye™ high-quality electric meters suit nearly any residential, commercial, or industrial application. We have been manufacturing electric meters since 1989 with a spotless reputation for quality power meters while standing behind the products sold with a 10-Year warranty.